*All maps owned by Google. 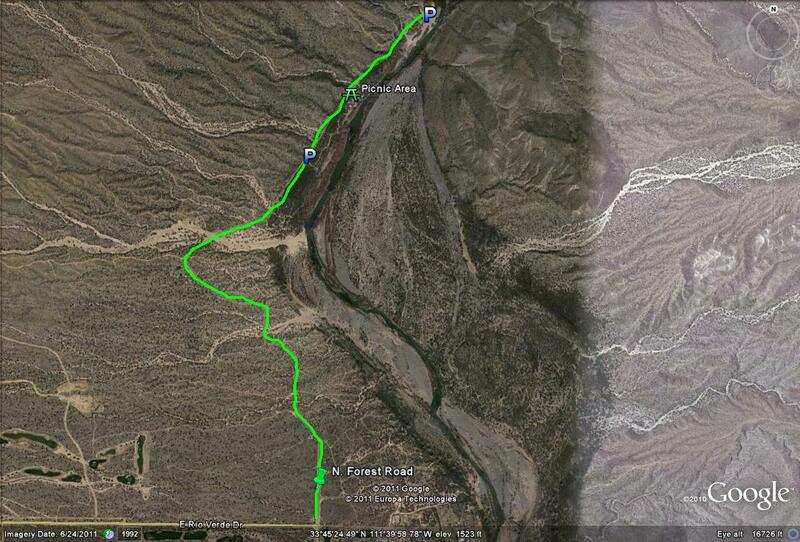 From the Loop 101-East (Pima Freeway), take Pima Road north for 6.7 miles to E. Dynamite Blvd. 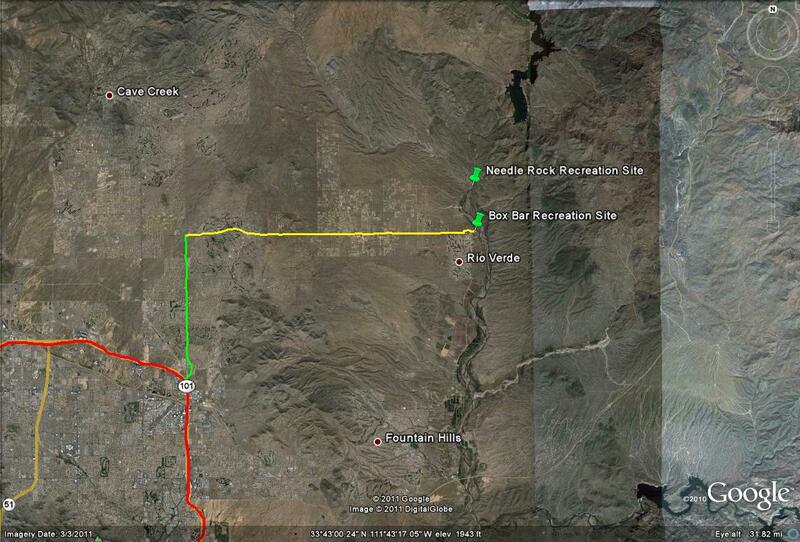 Once at E. Dynamite Blvd, head east (turn right), for about 13 miles. Dynamite Blvd turns into E Rio Verde Drive and at about 13 miles, Rio Verde Drive reaches it's end and intersects with N. Fort McDowell Road south of Rio Verde Drive, and N. Forest Road north of Rio Verde Drive. Fort McDowell Road turns into N. Forest Road. Head north (left turn) on N. Forest Road for about three miles to the parking spot, where there is a sandy beach alongside the river. If coming north, there is another smaller parking area in good mesquite bosque habitat just south of the main parking area. N. Forest Road runs for 2.9 miles before the final parking area. There are two parking areas prior to the main parking area when heading north up N. Forest Rd, which both have good birding also. The lime-green circular route shows the better section of this area birding wise. 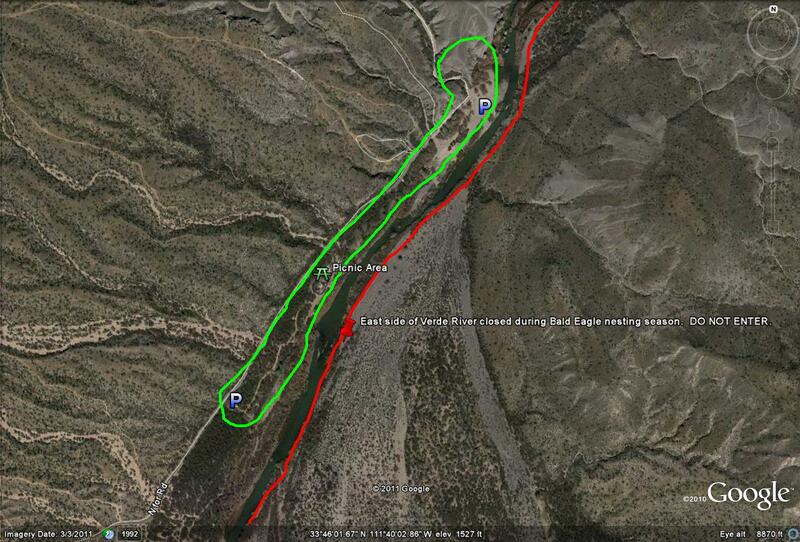 Don't cross the Verde River to the east side, as illustrated by the red line. If not in Bald Eagle nesting season, this east side of the Verde River will have good birding at this site if one proceeds to cross the river.